So, you want to become an expanded universe reader. The Expanded Universe is the term fans dubbed for the Star Wars products that existed outside the core of the films. If you’re coming to it now, you’re in luck, as it just had a reboot of sorts. The old Expanded Universe tried to maintain itself within the larger canon story of Star Wars as best it could, but across thirty years and literally hundreds of books and thousands of comic book issues, that task was nigh-impossible. With the Disney acquisition of Lucasfilm, they established a new “Story Group,” and made those old Expanded Universe stories into “Legends.” The new Story Group has the task of making everything Star Wars fit into one, cohesive, all-canon story, from the live-action films to the animated series to the comic books and novels, and even storylines that happen in video games! But where does that leave you, the growing Star Wars fan who is looking to check out the comics and novels for the first time? Well, it leaves you in a pretty good position, actually. 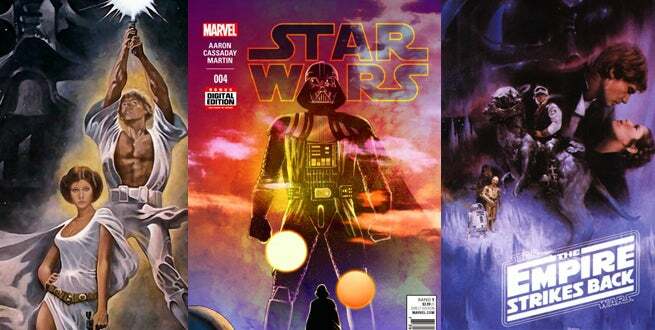 Marvel Comics started up new Star Wars comics in January 2015, with a gradual addition of one per month. Star Wars is the name of the flagship title, principally starring Luke Skywalker, and also featuring Han Solo, Leia, Darth Vader, and even Boba Fett. Darth Vader occurs exactly concurrently with Star Wars. This ongoing series features Vader as the protagonist, telling some identical events from his perspective, and showing what else the Sith Lord is up to as he attempts to re-establish himself after the failure of the first Death Star’s destruction. Princess Leia features a side-mission for her, and the only book not in the original trilogy era, Kanan, features the lead from the animated series Star Wars Rebels. Here’s what we know so far about how our main characters got from Episode IV to Episode V, thanks to the stories of Marvel’s comic series. Sure, he stood tall and triumphant with the Rebel Alliance at the end of the first film, but Han Solo was never exactly an enthusiastic member of the group. Content as a smuggler, Han never passed up an opportunity to let Leia and other Rebel leaders know that he had one foot out the door. How, then, is he with the Alliance on Hoth, three years later, still fighting the good fight? Well, we’ve seen at least the start of that story, primarily in Star Wars. The comic showed Han Solo first being recruited, soon after the Death Star’s destruction in A New Hope, to help a strike team destroy Weapons Factory Alpha on Cymoon 1. This assault was successful, but placed Han Solo (alongside the other Rebels involved) firmly on the Empire’s radar – and most-wanted list. That left the rogue with little else as far as places to go, and without too much hope of being a successful smuggler again. It also left him without much of a ship, as the Millennium Falcon was torn apart by scavengers. Needing the parts to replace it keeps him with the Rebel Alliance a bit longer, and sets us up for the increased relationship between him and Leia, his position in the Alliance, and gives us some idea of why he’s still there come Empire Strikes Back time. Leia is interesting: she’s always acknowledged in the films as a Rebel leader, but aside from the odd order here and there (and the way she can manhandle Han and Luke), we don’t get to see her as much of an active participant. That has changed thanks to her own comic. In Leia, we specifically see her deal with the destruction of Alderaan. The comic addressed some issues many had with the movies, as it spins directly out of the final scene of A New Hope. If the Rebellion counts Alderaan as one of its real birthplaces, how the hell can the Rebel Alliance be celebrating so much after destroying the Death Star; so much that they hold a freaking party and awards ceremony? Alderaan-born soldier Evaan brings this up, and is in turn recruited by Leia to look for other Alderaanians, and try to find a way to preserve their peoples and their history. Meanwhile, in the pages of Star Wars, Leia’s relationship with Han – complete with flirtation disguised as disgust in trademark Leia manner – grows every issue, and gets some much needed fleshing out. The entire story of that book is centered in the background around the Rebels looking for a new base, which again leads them to Hoth at the start of Empire. At the end of A New Hope, Luke Skywalker can basically use the Force to help guide a torpedo, and that’s about it. At the start of Empire, he’s Force-pulling his lightsaber and wielding it with some expertise. How the heck did that happen? Before meeting Yoda, Luke’s training is one primarily of introspection. In Star Wars, he meets Darth Vader face-to-face for the first time (more on that in a moment), and realizes just how far he has until becoming a Jedi. The most recent issue at press time even had Luke intuitively noticing that anger and hatred were leading him away from his Jedi training. That’s a major insight that helps show how he could come so far in three years despite no real master. We also see Luke, in a return to Tatooine, show gradual growth that more logically leads to his position in the Rebel Alliance come Episode V. He hesitates a little less, trusts his instincts a little more, and learns to be on his own instead of constantly relying on others. He also has to fight Boba Fett soon, but that may serve to add more dimension to the latter character than Luke (more on that in a moment). We should note as well, Luke had his own novel come out in 2015. In Heir to the Jedi, Luke goes on a side mission looking for a suitable new Rebel base (ties in nicely). On this mission, he starts to learn more about accepting help from others, and has his first telekinetic Force use: moving a noodle. Oh yeah, the Force is strong with him. When A New Hope ends, it’s safe to say Darth Vader’s standing is… mixed, at best. The Sith Lord killed one of the last Jedi (incidentally, his own old master) in single combat, but he also allowed the Empire’s biggest, most powerful weapon and a symbol of their strength to be destroyed. As the sole survivor of the disaster and the ranking official present, it would seem Vader would take a lot of that blame. Yet, at the start of Empire, he’s at arguably the height of his power, and the Empire as a whole fears him once again. So what happened in the in-between? Well, directly after losing the Death Star, Darth Vader was, in fact, demoted, but not until his second spectacular loss to the Rebels in so little time: the aforementioned battle at Cymoon 1. Vader, there, lost a major factory, came into contact with the X-Wing pilot who destroyed the Death Star (and started to realize their connection to on another), and acquired nothing to show for it. The only victory for him was a personal one, realizing the young pilot was wielding Vader’s own lightsaber from his days as the Jedi Anakin Skywalker. He also noted Obi-Wan’s disappearance into the Force and confronted his former master through meditation. This all serves to make Vader more powerful, and thus more imposing, come three years later in Empire. However, after the two defeats, Vader was held responsible for both by the Emperor, and placed under the charge of Grand General Tagge. These circumstance led to Vader considering his options, including the desire to gather personal resources, to find the young X-Wing pilot (Luke) and train him in the Dark Side to use as a weapon, and create alliances of his own, secreted away from his Master. All of this leads directly to Vader proposing open rebellion against the Emperor with Luke at his side in the later films. When Boba Fett was introduced in Empire, he was an instant sensation. His cool looks and deadly reputation made him cool and intriguing, despite literally nothing being known about him. Now, thanks to the Prequels and even more so the animated series The Clone Wars, Boba Fett has been fleshed out, but we still don’t know exactly why he would have the reputation that would warrant the Empire (and Vader specifically) to work directly with a lowly bounty hunter. With appearances in Darth Vader and Star Wars comics now, however, that story is beginning to be told. Fett first appeared as one of the bounty hunters that Jabba the Hutt provided to Darth Vader for a secret, off-the-books style mission. Alongside a Wookiee bounty hunter named Black Krrsantan, Fett was tasked with the more important of two tracking missions: finding the young X-Wing pilot associated with Obi-Wan Kenobi. His search pits him directly against Luke Skywalker, as Luke continues to try to uncover more clues on how to become a Jedi and why old Ben Kenobi was so intent on helping him. The ruthlessness and adept nature in which he handles his job help to make Boba Fett the awesome character we all assumed him to be when we saw him on screen more than three decades ago. It also gives us a much tighter connection between Fett and the original trilogy’s main characters, including both the heroes and Darth Vader.